Wouldn't it be easier if your HVAC and lighting systems worked together, in harmony? Unified Building Controls - Wouldn't it be Easier? one unified, graphical and actionable view of system performance and energy spend? optimal comfort and energy efficiency? more value … for the life of your building? Acuity Brands brings together a leading lighting and HVAC control solution, with a single, powerful visualization interface, for a truly unified building controls solution. reliability of multi-application integration, for improved comfort and energy efficiency. Traditional integration of your lighting and HVAC control systems results in disparate systems, duplicated components and overlapping control strategies, making it complex to install, costly to maintain and inefficient to manage. With Acuity Brands, the unified building controls solution you choose today is ready for tomorrow and able to support changing technology and grow with your business. Our solutions allow you to choose lighting and HVAC controls and reliably implement both. More importantly, our unified building controls allow you to efficiently unlock data from your systems, generating one visualization interface, as well as value-added building and business applications, from energy metering and sustainability dashboards to space utilization and other IoT applications. 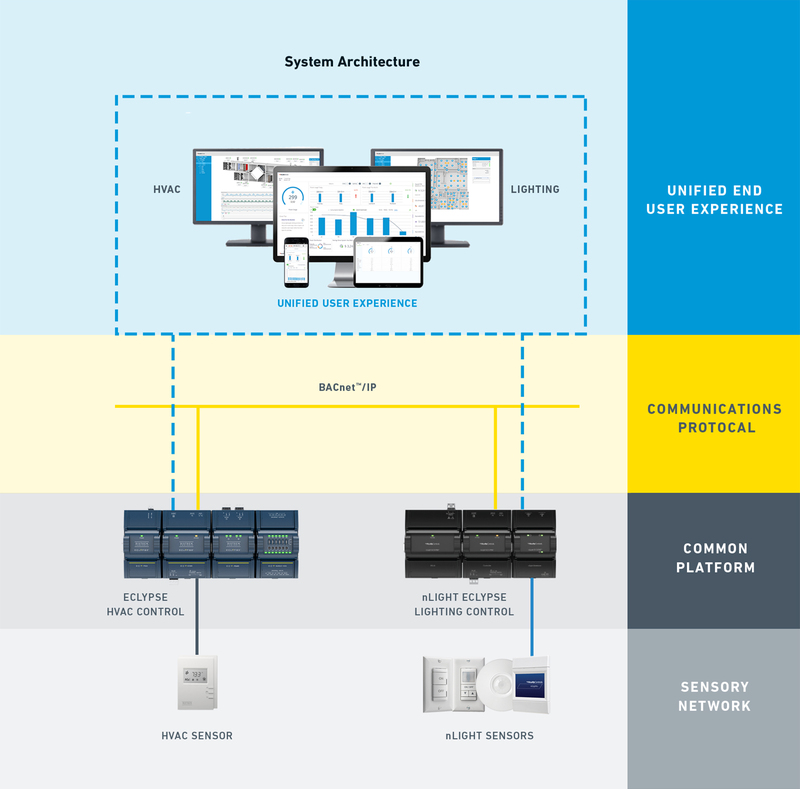 With our building controls platform, you can connect systems, technology and people throughout the lifecycle of your facility. Help Me Unify My Building!